Study finds nitric oxide may also determine drug efficacy. The most common heart medications may get an assist from nitric oxide circulating in the body, according to a new study out of Case Western Reserve University School of Medicine. Researchers showed that nitric oxide may help commonly used heart drugs maximize their benefits while improving heart function. In turn, the study found nitric oxide deficiencies could underlie heart failure while tilting drug effects toward more harmful pathways and side effects. "Our work shows that the main receptors in the heart that respond to drugs don't work without nitric oxide," said Jonathan Stamler, MD, senior author of the new study, Robert and Sylvia Reitman professor of medicine at Case Western Reserve University School of Medicine and president of the Harrington Discovery Institute at University Hospitals Cleveland Medical Center. "The study provides new motivation to replace nitric oxide during heart failure." The new study focuses on one of the most common drug targets in modern medicine: GPCRs, short for G protein-coupled receptors. The receptors sit on cell surfaces and are targets for nearly one-third of FDA-approved medications. When drugs like beta blockers attach to GPCRs, they influence protein pathways inside the cells. One pathway activates "G proteins" that are of therapeutic benefit, while a second pathway activates proteins called arrestins that can lead to side effects. The new study shows nitric oxide helps determine that the right pathway gets activated. Previous studies have shown evidence of "biased" signaling inside cells, where one pathway becomes more active than another. This led Stamler and colleagues to look for natural mechanisms inside cells that could be leveraged to maintain the desired balance. "Drugs and hormones inevitably regulate both pathways, but if one could shut down the pathway producing side effects, drugs would work better. In the new study, we have discovered how nature signals without side effects. It is able to use nitric oxide to shut down arrestin-based pathways causing side effects," he said. The researchers investigated nitric oxide due to the molecule's established role in receiving signals from GPCRs. The team genetically engineered mice to lack the ability to attach nitric oxide to one half of the pathway -- the arrestin proteins that can trigger side effects. "The mice had classic features of heart failure," Stamler said. "Without nitric oxide signaling, they could not increase heart rate or pump function." The researchers confirmed their findings in human tissue samples, collected from hearts involved in transplants. In nearly two-thirds of failing heart samples, the researchers found that nitric oxide determined signaling balance to the arrestin pathway. Many hearts showed evidence of nitric oxide deficiency (arrestin activation). The results suggest heart failure severity could vary based on nitric oxide levels in the body. 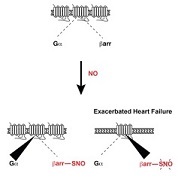 Low levels could cause GPCRs to primarily activate the arrestin side of their signaling pathways -- leaving out the other half that helps the heart respond to stressors. "Without nitric oxide, heart rate and contractility can't increase, and thus hearts fail," Stamler said. With hundreds of GPCRs in the body, the findings could be universally applied. According to the authors, managing nitric oxide could help existing drugs of all types work with fewer side effects. "We have identified a main function of nitric oxide in cellular systems," Stamler said. "It likely regulates GPCR signaling across virtually all cell types and tissues. This may bear directly on numerous diseases as well as the predicted response to therapeutic agents." Illustration: Graphical abstract. Molecular Cell.